Turn your daily shower into a spa escape. Emollients and humectants in this shower gel help nourish skin with moisture as you cleanse, while the sensual, warm hint of vanilla with juicy lychee and blooming freesia indulge your senses. With your pampering complete, emerge from your shower ready to face the day. Ingredients: Aqua/ Water/ Eau, Sodium Laureth Sulfate, Cocamidopropyl Betaine, Sodium Cocoyl Isethionate, Parfum (Fragrance), Coco-Glucoside, Glyceryl Oleate, Aloe Barbadensis Leaf Juice, Althaea Officinalis Root Extract, Arginine, Benzyl Alcohol, Benzyl Salicylate, Castoryl Maleate, Coumarin, Guar Hydroxypropyltrimonium Chloride, Helichrysum Arenarium Flower Extract, Hydrolyzed Wheat Gluten, Imidazolidinyl Urea, Lactic Acid, Limonene, Linalool, Phenoxyethanol, Polyquaternium-7, Potassium Sorbate, Sodium Chloride, Sodium Dehydroacetate, Sodium Gluconate, Tocopherol. OMG I love this. the only thing I wish was that the price was lower. I think this small bottle is like $19.00. and others are a lot bigger for less. However, all in all great product. This is my scent LLLLOOOVVVEEE!!!!!!! This scent is so lovely. I already have the parfum and body butter in this scent. This shower gel completes the collection. It's a natural, woodsy scent. Different. I love it. Hope to get more products in this scent. I bought this on a whim because it sounded pretty and got good reviews bot OH GOSH it is so beautiful. It is all I want to use now. Its sort of vanilla and sort of floral and sort of musky but not too strong at all... I cant stand strong scents. Its just amazingly beautiful and I am using the body butter as well. The combination of the two lingers for hours and just makes me feel awesome. Dont ever stop making this Korres :) I love it! 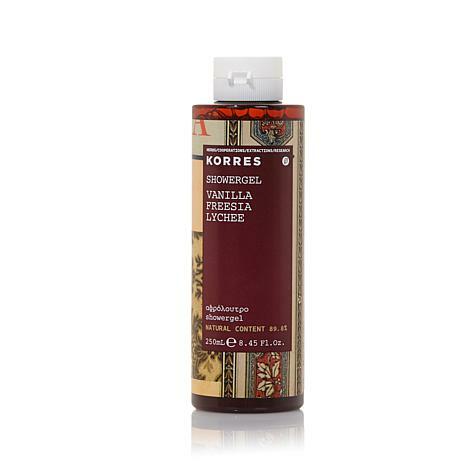 Korres Greek Yoghurt Shower Gel - 2.7 fl. oz. 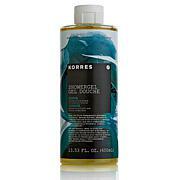 Korres Guava Shower Gel - 2.7 fl. oz.